90,000 people who live in 50 different cooperatives, their houses are made of cane and cement. Hundreds of people are settled in a cooperative called Merida de Toral, they live in very rustic conditions at the shore of Estero Salado (translates to salty estuary). This is where, on March 27 of 2015, one of the most violent evictions took place, 40 families were dislodged by the administration of Rafael Correa with a zero-tolerance policy against land invasions. They justified this government measure with the project Ecologic Guayaquil, that intended to recover the green space and take care of the mangrove. 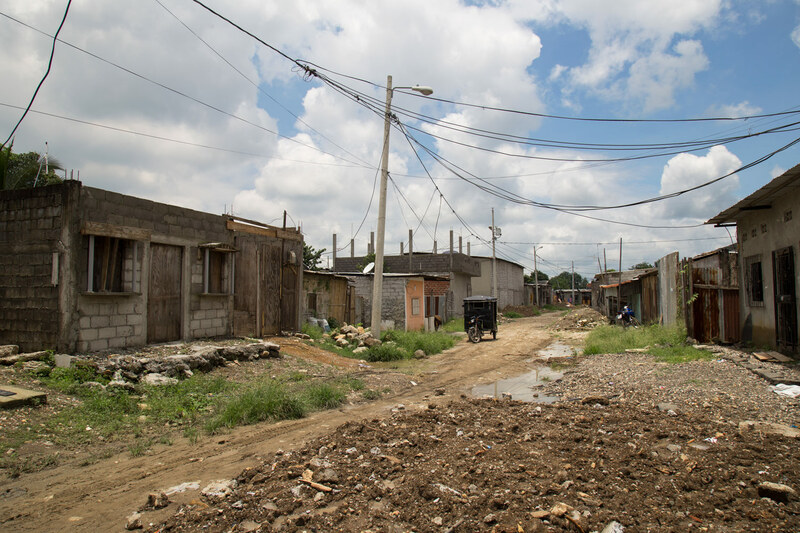 Government officials promised to relocate the affected families, but four years passed and these families are still living in illegal properties or in neighborhoods like Socio Vivienda 2 (translates to Partner´s Housing 2) constantly dealing with insecurity. Besides the cobbled roads that were built in the ecological corridors, there are dirt and mud streets. The demand for basic services has not been attended. Plan V toured this area and the places where people were relocated and continue to endure the same problems. Find the full article in Spanish here.